We hold Kamishibai seminars twice a year --- once in Tokyo, once in another Japanese city.And we issue semiannual IKAJA'S JOURNAL in Japanese as well as annual KAMISHIBAI NEWSLETTER in English. On this day we wish for peace on Earth as we share kamishibai together. Event summary of "in your town"
There were 43 events at 20 countries and areas at December 7, 2018. Eiko Matsui talks about the culture of kamishibai and how kamishibai creates peace. She also explains the unique format and the key features of kamishibai, which bring kyokan. 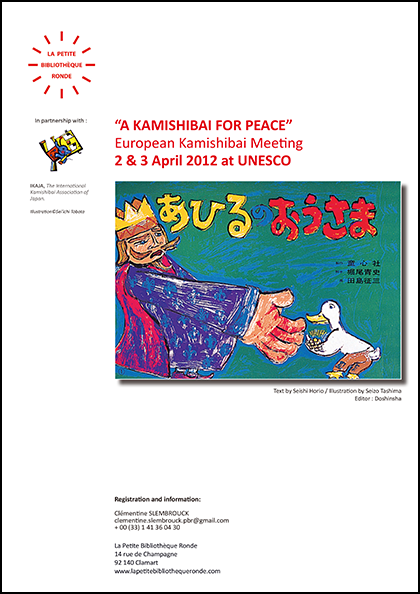 In April 2012 we coorganized the first European Kamishibai Meeting at UNESCO, Paris in cooperation with La Petite Bibliotheque Ronde in France. In addition to the seminar and the presentation of kamishibai by Japanese members on the first day, IKAJA's International members from France, Germany, the Netherlands, Spain and Switzerland made siginificant reports on their activities on the second day. Theme: "Let Peace Shine with Kamishibai"
Theme: "Kamishibai - For a Bright Future"